This large, striking and extremely collectible Teakwood Marble Gemstone Egg was mined, sculpted and richly polished by hand to a smooth satin finish in Pakistan � the home of the highest quality and most beautiful Teakwood Marble in the world. Also known as Burma Teak, Burma Teakwood, or Burma Teak Stone, it is highly sought after by both beginning and serious gemstone egg collectors and home decorators alike. This exotic Teakwood Marble Gemstone Egg is an excellent example of this how this lovely, opaque semi-precious gemstone grows deep within Mother Earth. The beautiful and natural hypnotic bands, or "rings" of beige, tan and light and dark brown tones and pale grey veining bear a striking resemblance to the wood grain and knots of Burmese Teakwood, hence the name. This Teakwood Marble Gemstone Egg features off set oval bands, or "rings" with pale grey veining on one side (pictured) and an oval shaped bullseye of rings on the other side. 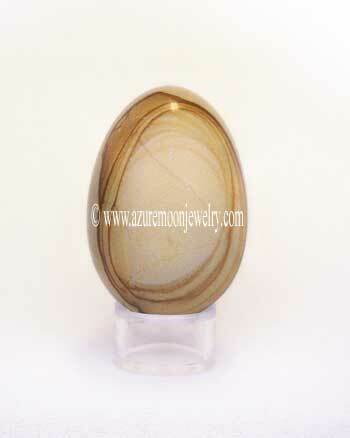 All of which make this marvelous Teakwood Marble Gemstone Egg truly one of a kind. Honestly, the photograph just doesn't due this Teakwood Marble Gemstone Egg justice! The subtle blending of shades and minute details that are visible to the naked eye are very difficult to capture in a photograph - it has to be seen in person to be truly appreciated! And to the untrained eye, the veining may look like fractures within the stone, but they are actually caused by the natural shift that occured within the Limestone during it's natural growth process. This delightful and exotic Teakwood Marble Gemstone Egg will certainly make an impressive and beautiful addition to any new or existing gemstone egg collection, as well as a wonderful Easter, or spring time display, fabulous kitchen decor, or a thoughtful and sure to be treasured unique gift! And remember - gemstone eggs are perfect for use in crystal healing, chakra therapy, meditation and therapeutic massage too! This Teakwood Marble Gemstone Egg is the size of a duck's egg and measures approximately 2 15/16� L - 2� W and weighs 246 grams or 1230 carats. The crystal clear acrylic display stand is included. Please note that this is a 100% natural, polished Teakwood Marble Gemstone Egg with natural veining, as well as some small natural flaws and inclusions that occurred during the Teakwood Marble's growth process which add interesting and unique characteristics to the gemstone. Said veining, natural flaws and inclusions are not considered a defect, but rather a characteristic of the natural beauty and wonder of the earth's geology. Please scroll down to add this item to your cart, or to read more on Egg Symbolism and Gemstone Eggs. Teakwood Marble is a trade name for a form of metamorphosed Limestone found only in the mountains of Pakistan. Also known as Burma Teak, Burma Teakwood, or Burma Teak Stone, it is sometimes erroneously called, or sold as Picture Jasper, but again, it is a form of Limestone � NOT Jasper. Metaphysical Properties: Teakwood Marble, as well as all the colors of Marble, are used to provide for both clarity and suspension in states of meditation, including tantric activities. It promotes peak states of meditation and total recall of dreams, in addition to producing a nurturing instinct. It also helps to actuate the �unused� portions of the mind, providing for the strength of self-control, the mastery of thought and the power of serenity. Teakwood Marble can enhance good common sense in matter of the home, the heart and ones sustenance. It also provides for strength of character and is also a �stone to provide protection� � both physical and emotional. Click here to learn more about the lore and metaphysical properties of Teakwood Marble and other popular gemstones. Throughout time the egg has symbolized new beginnings, protection, resurrection and the spark of creation for many religions. Considered a powerful symbol of fertility, purity and rebirth in traditional folk religions, magic rituals often use eggs to promote fertility and restore virility of the body and mind. Christians embraced the egg symbol long ago and likened it to the tomb from which Christ arose. Archeologists have discovered clay eggs in prehistoric graves, but it was the Ancient Romans who actually began the tradition of decorating eggs to celebrate the Vernal Equinox, also known as the spring equinox, or the first day of spring - a time of renewed hope for those who had made it through a difficult winter. And of course the egg is an important part of Easter celebrations worldwide. 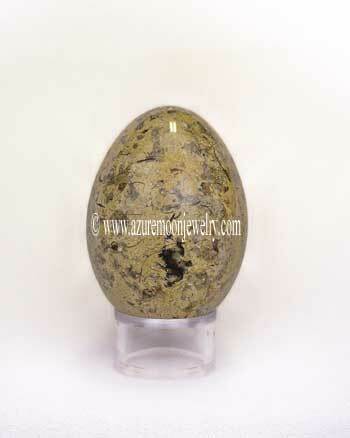 The gemstone egg is a very important and versatile tool in crystal healing. Whether the egg is natural in shape, or carved by man, the metaphysical properties are the same. Gemstone eggs are also used for acupressure, reflexology, scanning the auras, Shiatsu, zone therapy, or to simply massage and soothe sore areas of the body. The curve of a gemstone egg fits perfectly into the curvature of the hand, making it perfect to hold during meditation, or use either end to apply gentle pressure to soothe sore areas of the body.